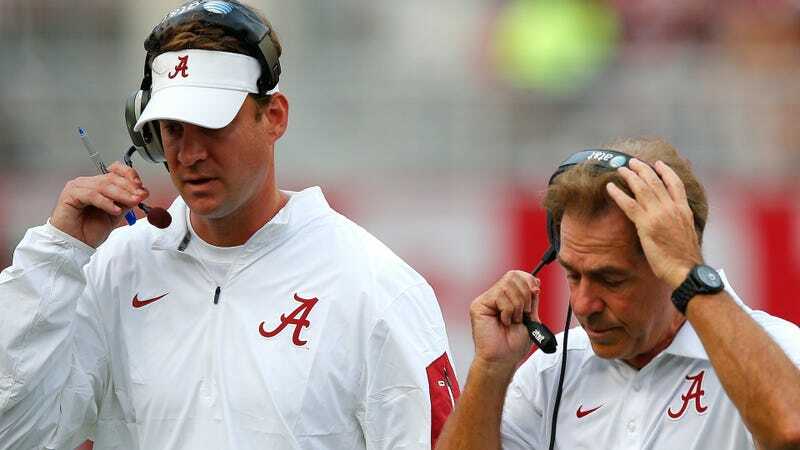 Kiffin says he still sends text messages to Saban, though Saban doesn’t text back — with anyone. However, Kiffin has conversed with Saban’s wife, Terry, via text message. While appreciative of what Saban did for him, Kiffin goes where few do. He loves poking the bear and reveals that he still has a video of Saban dancing at one of the karaoke parties Saban throws for the parents of recruits during official visit weekends at Alabama. There’s a video out there of Nick Saban dancing—dancing, moving his body in such a way that indicates an understanding of concepts like rhythm and pleasure and fun, or at least something like that. Maybe this one is even better than the previous entries in the genre (a shaky glimpse of him doing the Cupid Shuffle and a few seconds of him flopping his arms around like a T-Rex after last year’s Cotton Bowl victory). Please, Coach Kiffin, do your duty and share with the people. Nick Saban: What&apos;s The Deal With Jeans?